Our school uses themes to guide the materials, toys and books that we have out, and the projects we do. For example, during Castles, children may explore jewels in the tactile tub, try on crowns and long red robes in the dramatic play area and design their own castle in the block area. During Dinosaurs, the children pretend to be paleontologists excavating fossils from the tactile tub, they share books and songs about dinosaurs and act out looking for food, or burying eggs and protecting their babies. In the spring, when we focus on Butterflies, we watch small caterpillars eat and grow. We marvel as they spin their chrysalis and emerge as butterflies. We gently hold, feed and watch the butterfly before we release it to its new home in the flower boxes that surround our playground. A focus project is an opportunity to delve deeper into a topic. As the children are exploring, experimenting and thinking about their world, they may come up with a concept they are interested in investigating more thoroughly. The squirrel that played outside our window entertained us and captivated our attention. This interest became a summer long focus on squirrels. Field trips to find other squirrels at “home,” drawing squirrels, clay squirrels, squirrel habitat discussions were all important parts of our focus on squirrels. The children decided our squirrel needed a special place in our playground dedicated to him. They described a squirrel mural to decorate the window well where he liked to play. The chidren enlisted the help of Elizabeth and together they were able to make their conceptualization a reality. Climb aboard our own mini school bus into our car seats and the adventure will follow... At ABC we are fortunate to have a school bus to provide safe group transportation. Safety seats appropriate to the age and weight of each child are always used. 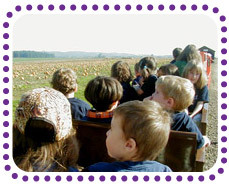 Field trips are an integral part of our preschool program. They allow us the opportunity explore and discover the world around us. We attend children's plays, enjoy concerts in the park, walk through the woods at the arboretum, pick fruits and vegetables and picnic on Sauvie Island. We also visit the gymnastics gym regularly during the rainy months. We continually search new places to explore. Our park experiences are varied by the children's whims/desires: rolling down the hills at Fernhill Park, running through the trees at Pier Park, and raking and jumping in piles of leaves in Rose City Park are just a few ways we enjoy the parks around us. We continually search out opportunities that will bring the children into their community. We are fortunate to have artists in residence who share their talents with our children. These experiences enhance all areas of our program. Every day children at ABC are surrounded by different types of music, whether they are singing, listening to CDs or exploring with instruments. A music therapist comes weekly, sharing her guitar, accordion and many hand-held instruments. Our music activities help children increase body awareness and coordination, develop language, increase social skills and promote musical skills and interests. 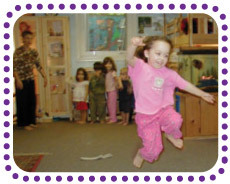 We believe children need opportunities guided by professionals specializing in children's creative movement. Our movement teacher brings various rich music and movement experiences. 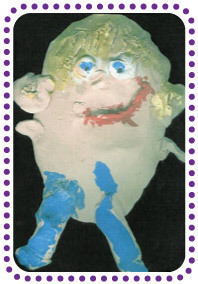 She offers wonderfully enriching experience for your child – a special time set aside each week to explore each child's physical and creative potential. We stretch and sing while we dance. We listen while we dance, we make up story dances with music. We may use scarves, drums or balloons. We celebrate music through the seasons as we dance along. All content © 2006 Alameda Beaumont Childcare Inc.